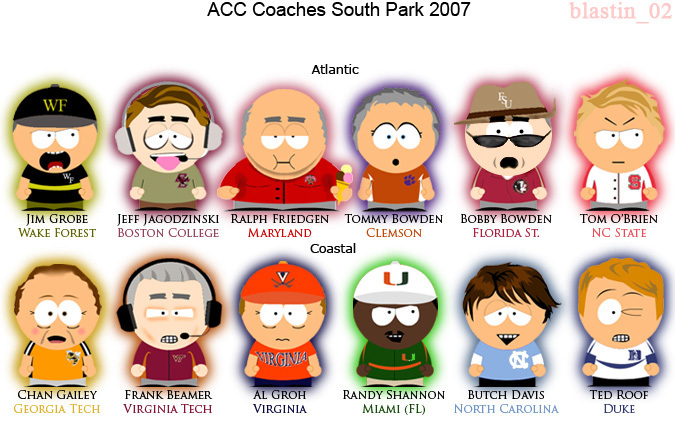 Let’s take a moment out of our busy days to sit back and enjoy some lovely artwork of the 2007 ACC Coaches. Some of you may have already seen this, but I couldn’t resist posting it on the blog, just in case. Hope it makes you laugh as much as I did. As one guy in my office put it, “Look at Frank, he’s got the eye of the tiger!”. Does anyone else think that Al Groh looks like a timid little boy who just dropped his soap in the gym shower? ok, Back to working hard… or hardly working…whatever. Enjoy!